Being out of alignment with our authentic sound impacts all areas of life – confidence, sense of self-worth, health, relationships. Be supported in a safe space to play gently with your edges and embody your joyful, expressiveness! 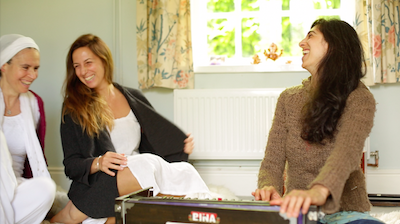 Exploring the body (yoga asanas and chakra work) and voice (Indian scale, simple mantra, chants, songs and free sounding) together to free up your own authentic sound – and experiencing how vocal sounding can allow a deepening into asana. Please sign up if you would like updates on upcoming retreats. And see below for an example of a sold-out retreat I held last year. This retreat will incorporate devotional song and mantra (from the Indian and other traditions) and draw on a variety of vocal practices and the rich local tradition and wild landscape to support a deepening connection with our wild and sacred heartsong! Singing in local sites of natural beauty, historic interest or exceptional resonance! I never know what will come through but I have held space enough times now to trust that – if I can get out of the way as much as possible – it will be magical and transformational! 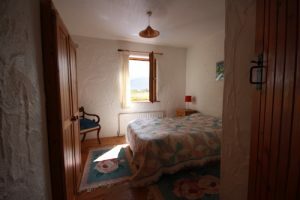 Teach na nAmhrán: The Song House lies on the world renowned Wild Atlantic Way. The nearby coast, with expansive wild and empty beaches bordered by sand dunes, stretch for miles and look out onto Tory Island. 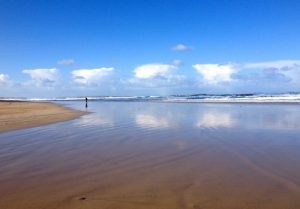 The seascapes are spectacular in stormy weather, yet gently sloping sandy beaches make these ideal swimming spots in warmer seasons. 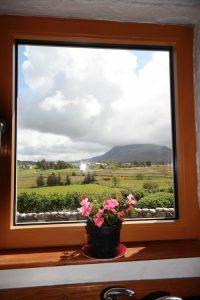 Muckish Mountain, Errigal Mountain and Glenveagh National Park are a short drive away. 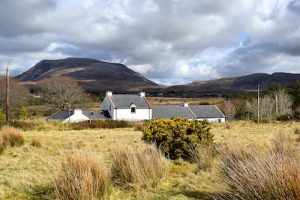 One mile from Falcarragh, with local shops and pubs, some serving excellent food, Donegal retains traditional values. The local pubs have regular music sessions where Irish music both past and present is performed by local and visiting musicians. Anyone is welcome to join in. 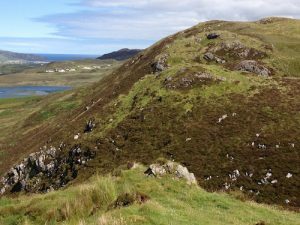 As Falcarragh forms part of the Gaeltacht (the Irish-speaking areas) you will hear the language spoken around you. The area is rich in recreational activities. 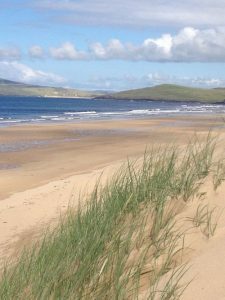 A Surf /Water sports school in nearby Dunfanaghy, excellent hill walking, biking and mountain climbing and several popular golf courses. 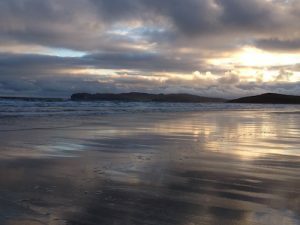 Dunfanaghy (15 minutes by car) has restaurants, pubs, and an organic/wholefood shop. It also has an historic graveyard dedicated to the victims of the famines, and the Old Workhouse, now a museum. 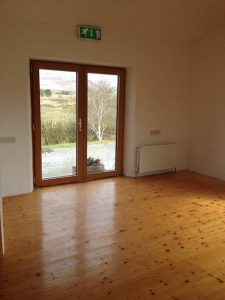 The rooms in the Song House all overlook Muckish mountain. 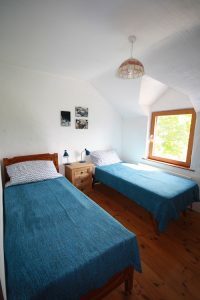 There is one dorm sleeping 4 (also bookable as a family room, sleeping 5) and the rest of the rooms are Twins which you can share with one other or book as a Single. We will have a wholesome and tasty breakfast and dinner prepared for us using local and organic ingredients as far as possible. As you may wish to go to the beach, walk, explore, adventure, go kayaking etc. during the day, you can create your own from supplies we will have available for you. If you wish to arrive earlier, there may be availability to extend your stay – please email. There are many ways to reach The Song House. Candy recommends Dublin as the simplest. Information on car shares and car hire can all be found on a wonderful site getthere.ie. Some participants have already decided to rent a car and drive together. If you would like to be connected, please let me know. Arrival is between 3pm-6pm on Monday 17th and Departure between 9-11am on Friday 21st. Please email to arrange arrival or departure outside of these times. Coach (2 ¾ hours, 1 daily: http://www.gallagherscoaches.com). The coach doesn’t stop at the airport, but if you phone them, they’ll arrange for a taxi to drop you from the airport to meet the coach on the main road. If cost is a barrier for you, please email explaining your circumstance and a little about yourself and why you would like to attend the retreat. For a single room, add £120 to the Twin sharing rate. The only PREREQUISITES are a willingness to be playful and a longing to connect more deeply with your heart. You do not need to consider yourself “ABLE TO SING”. Does the idea of booking this retreat terrify the living daylights out of you?! Do you yearn to sing and express yourself more confidently? Do you feel your voice doesn’t really communicate your authentic truth? Do you feel hopelessly self-conscious singing or speaking in front of others? Do you wish to reconnect with your playful inner child? The one who KNOWS HOW TO SING? Would you love to ramble about the wild Irish coastline, singing your heart out with a group of totally nonjudgmental, safe playmates? Have you, like me, fallen in love with Indian devotional song and wish to immerse more deeply in it for several days at a time? If you answer “yes” to any of these questions, do get in touch. I may be able to allay any concerns or fears that this is not for you. 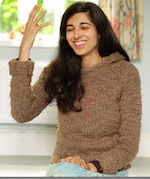 Vaishnavi didn’t believe she could sing til she was introduced to mantra in her late twenties. Through Kundalini Yoga she tentatively began sounding and through being introduced to Indian devotional song, she finally found her way home (AUM). Vaishnavi spent several years living in a large Indian ashram, immersing herself in daily chanting of Sanskrit verses. During this time she also led bhajan (Indian devotional singing) for thousands for people. 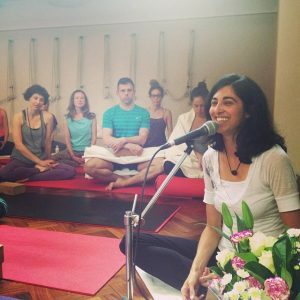 Now back in the UK, she remains anchored in her dedication to these sacred practices while sharing them in a playful and accessible way. This is the first retreat she has offered since the enormously well-received Breath by Breath retreats she held with Preet Kaur in 2013-14. 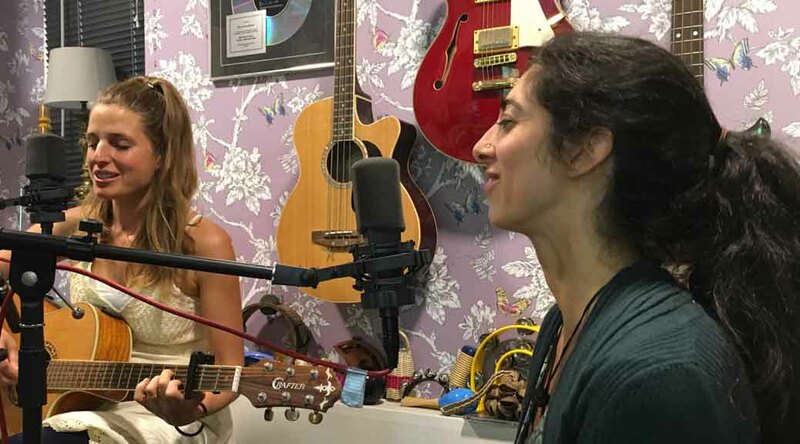 She is a trained Kundalini Yoga teacher and has studied with Rajeswar Bhattacharya (the foremost singer of Tagore raga) and Chloe Goodchild and the Naked Voice. The greatest teaching, however, has been a flowering of the heart and a transmission of bhakti (devotion) through her time with Amma (Mata Amritanandamayi). 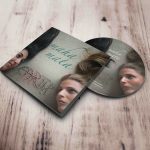 She is one half of the duo EARTH whose debut CD Maha Maha was released in December 2016. Candy Verney is a teacher and mentor of mine and we are incredibly blessed to have her vibrant energy and presence with us on this adventure! 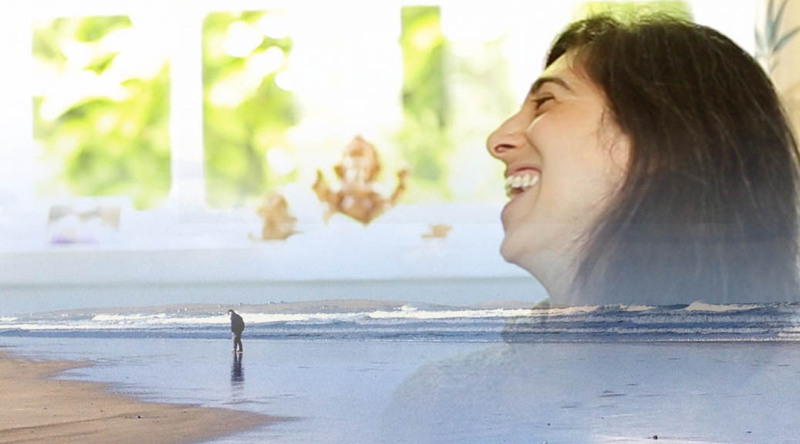 She will be sharing some precious songs from diverse traditions in some wild and inspiring spaces – on the beach, in a sacred site and in a resonant church space (weather permitting). Her passion is to inspire and create, through singing, a sense of harmony which gives an experience beyond the ordinary. Group singing has a power unlike any other to bind people together. More traditional communities have known this, and we are rediscovering this today. Singing has the power to build bridges between cultures and communities with differing world views. This is a common theme in all the work Candy does. Candy is a skilled facilitator excelling in breaking down barriers and creating unity through singing. Over time Candy has gained extensive experience in developing harmonious teams using the voice, working with a wide spectrum of individuals including businesses, universities, hospitals (staff and patients) social services and education. She is in regular demand throughout the UK and mainland Europe. She is a member of the Natural Voice Practitioners Network. 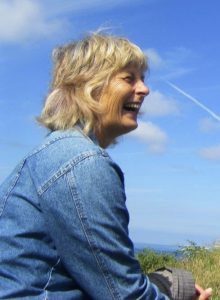 Playfulness – will be a foundation of the four days as we gently explore reconnecting with our innate inner child in a safely held space. Connection – with our own hearts, those around us, the natural world. 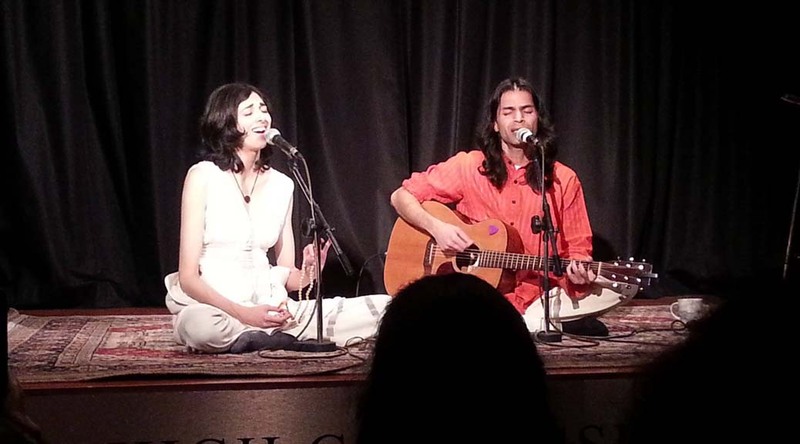 Singing and sounding deepens our intimacy with life and existence in a magical and effortless way! Sound Waves – witnessing the rise and fall of sound each day as we begin from silence, rise into fully expressive sound and gently sound ourselves back into silence. 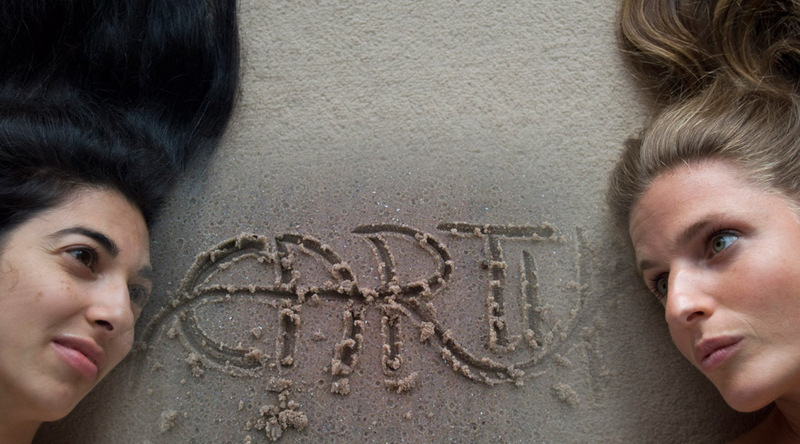 Listening – to ourselves, others and the world around us – plays a key part in sounding. We will play with deepening our listening through call-and-answer chants, group sounding, harmonising, Triads (from The Naked Voice) – and also using a technique called Listening Partnerships. Silence – is the space from which all sound emerges and dissolves back into. We will spend some time time in silence to connect more deeply with ourselves and the natural world. Movement – Sharing simple stretches to open the body for the voice to flow, sounding in simple and easy yoga asanas, walks on the beach and in the countryside around – for starters. Healing – Sound and voice are innately healing – and we will also close each day with a group sound healing experience that will deeply relax and leave you ready to slip into sleep. 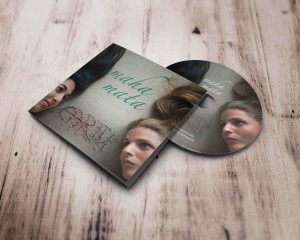 EARTH’s debut album Maha Mata was released in December 2016. You can listen to the entire album right here… through the player on the left (or below). Vaishnavi loves shares sacred music in different formats with different levels of participation from those present. 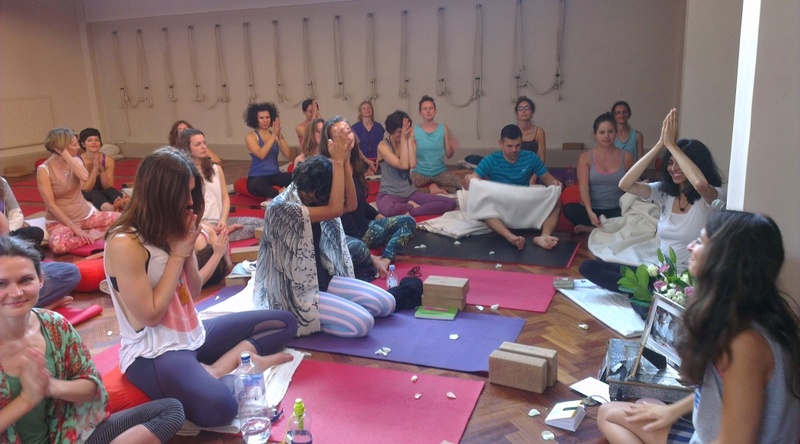 Kirtan breaks down the concept of an “audience”, inviting everyone to join in – whereas SongBaths are sound healings, received lying down, after being guided into a deep relaxation. Sign up or Get in touch if you would like to be updated when the next date is scheduled. Be guided into deep presence and stillness, beyond relaxation: a profound letting go into sacred space. Vaishnavi will hold you tenderly in that receptive state and, responding to the energies and needs of each person present, channel Divine healing song infused with sacred mantra. This powerful sound healing journey will finish with an experience of profound oneness through a group healing songbath.